Synonyms: Naprepa Walker (praeocc; type species varians); Chazena Walker (type species velata Walker = varians). Externally, species of this genus resemble those of Ocinara. In the male genitalia the uncus is undivided, the valves small, curved, tapering. The eighth tergite is elongate, simple; the eighth sternite is bilobed posteriorly and has a pair of long processes anteriorly. In the female genitalia the ring of the eighth segment is narrow but complete; the apophyses of the ovipositor lobes are very long, those of segment 8 short. There is no signum in the bursa. The larva of the type species was described by Sevastopulo (1942). The young larva is grey with large subdorsal black spots on segment A2 and a short, fleshy, curved horn on A8. When fully grown it is dull brown, with greyish stripes anteriorly, and, from A2 backwards, mottled paler dorsally and dark brown laterally. A2 itself has a purple brown, double, dorsal hump, edged in front by a black crescent; a lesser but similar feature recurs on A5. The horn on A8 is short and fleshy. The host-plants were Streblus and Ficus in the Moraccae. The penultimate instar is illustrated in Plate 19. Earlier instars have the horn longer, but it is very short in the final instar. 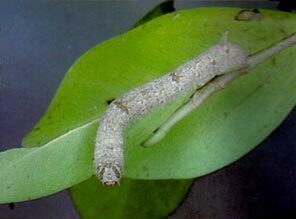 The cocoon is boat-shaped, closely woven with white or yellow, rather papery silk. The pupa is pale yellow, thinly chitinised. The type species is widespread in the Oriental Region, extending to Taiwan, the Philippines, Sulawesi and Java but not to Borneo. Other species are more localised, with endemics to China (sinica Dierl), the Philippines (myodes West), Sulawesi (undescribed) and the species described below.